I’m perched atop a chandelier in a once-grand dining room, now serving only corpses, and the witches who made them. There are three of them, powerful servants of the usurper Delilah. They loll idly around the room, chatting about dancing. I could sneak past them without too much difficulty. But I recall a conversation by another group of witches, where they talked gleefully about how they pushed an old woman off a roof. I don’t feel much like sneaking today. In the corner of the room is a dormant Clockwork Soldier; a giant, mechanical sentinel with swords for arms. Using Corvo Attano’s Blink ability, I teleport behind it and quickly rewire its targeting mechanism. As the gears in its chest cavity spool up, I hop back up to my original position on the chandelier. Now it is MY Clockwork Soldier. I’ll call him Brian. Brian targets the witches, and his blades chew through them like a swarm of rats through a Dunwall mortuary. But the commotion attracts a second Clockwork Soldier (I’ll call this one Graham), which sets its sights on Brian and rounds the table to attack. The two lock blades like a pair of stags during a rut. But Brian is already damaged from his fight with the Witches and is swiftly dispatched by the more robust Graham. Furious at the destruction of my beloved Brian, I leap down from the chandelier onto Graham’s back, and tear the Clockwork’s bird-like head from its shoulders. Now blind, the Clockwork flails its sword-arms wildly. Sliding beneath those giant blades, I whip out my pistol and fire an explosive bullet into Graham’s spine. The Clockwork judders, crackles, and explodes. Just as I’m about to sheathe my sword, another witch appears. Before she can attack, I pull out my crossbow and fire two bolts into her stomach. She grunts, but remains standing. I slide toward her, avoiding her conjured projectiles, and then sweep her legs out from under her with my sword. The witch crumples to the ground. I put away my weapons. The entire battle takes less than 90 seconds; I’ve been having encounters like it for about 17 hours. 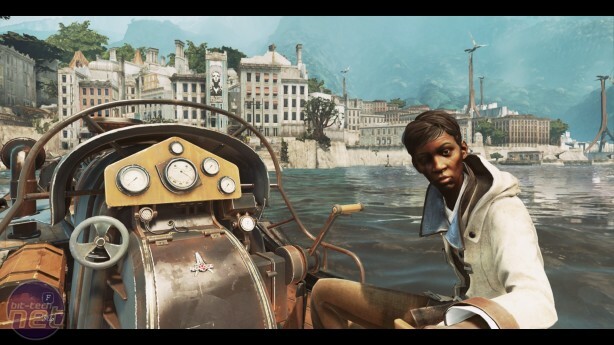 On paper Dishonored 2 seems like a straightforward sequel. 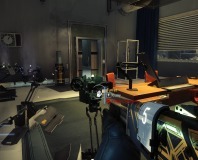 It takes the concept of the first game, an immersive assassination simulator that blends semi open-world stealth with explosive, emergent action, then offers players a few new toys and a larger sandbox to play with them in. 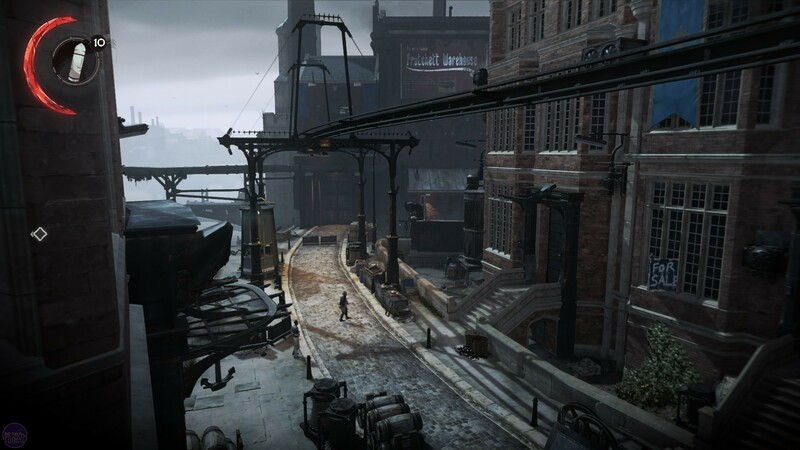 But such checked-boxes bely the astonishing craft and attention to detail that has gone into Dishonored 2, and the levels of freedom and creativity that the game’s ingenious mechanisms enable. Perhaps this shouldn’t be surprising, given what an impressive feat of engineering and artistry the first game was. But it really is. Dishonored 2 isn’t just more of the same; it sees the concept distilled, refined, expanded, and used as a platform for some flights of mind-blowing imagination. It may not completely dispel some of the gremlins that lurked in the cogs of the first game. 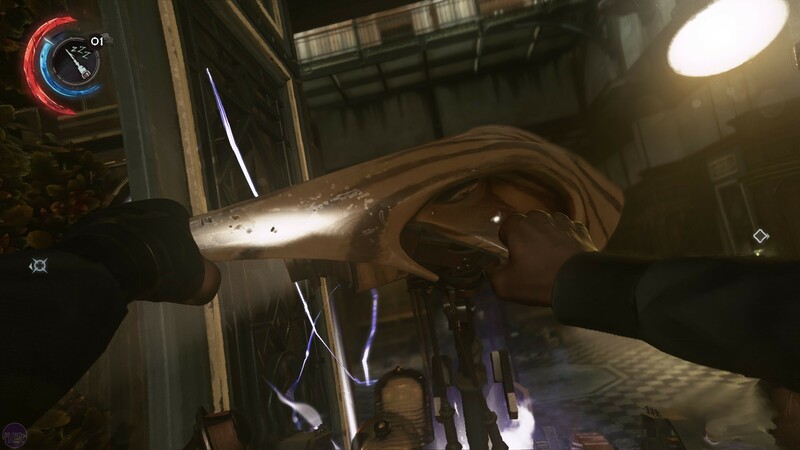 But make no mistake, Dishonored 2 is virtuoso game design. Arkane’s second stab at magical murder takes place fifteen years after the original and lets you experience its tale of vengeance as one of two characters. 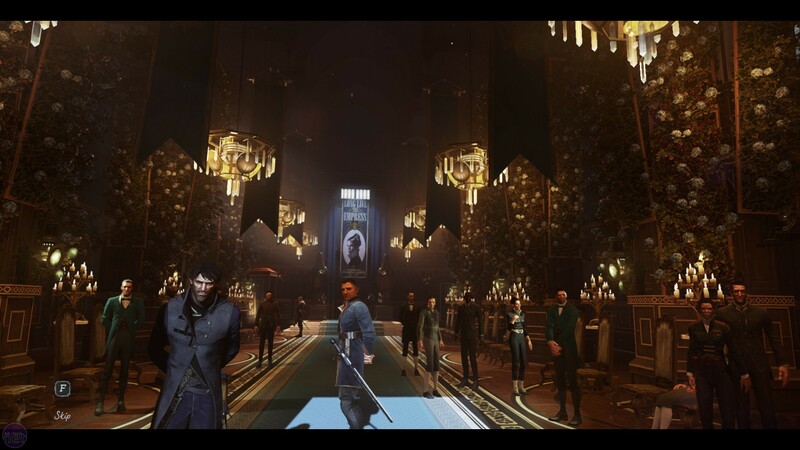 Corvo Attano, Royal Protector of the Empress of Dunwall, and protagonist of the first game, returns to defend the throne once more. The other playable character is the Empress herself. A child in the first game, Emily Kaldwin is now a young woman struggling with the burden of leadership. At night she escapes to the rooftops of Dunwall, using the climbing and evasion skills taught to her by her father. Emily doesn’t have to struggle with her Imperial responsibilities for long. Within five minutes of the game’s opening, Emily and Corvo have been deposed in a conspiracy between the Witch Delilah and Duke Abele of Serkonos, a sub-tropical island south of Dunwall. It’s an extremely brisk opening, perhaps a little too brisk, sparing little time to establish much of a relationship between the central pairing. On the other hand, it propels the player quickly onto the meat of the game, which as before involves navigating large, intricate environments through a mixture of traditional stealth, inventive magical powers, and bloody, fast-paced combat.